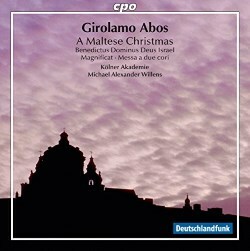 Listeners can be forgiven for not having heard much by Girolamo Abos. Currently, there are only three CDs featuring his music noted in the catalogue. The present disc is the only one dedicated solely to his work. I can find no reviews whatsoever in The Gramophone magazine, nor any ‘hits’ on the MusicWeb International review database - apart from this present CD being noted in the ‘download news’. The three works presented here make an excellent introduction to his work. A few words about the composer may be of interest. Girolamo Abos was born in Valletta, Malta on 16 November 1715; he was of French descent. Whether he is classified as a ‘Maltese Composer’ is a matter of opinion. Abos was a pupil with Girolamo Ferraro and Francesco Durante at Naples. Between 1742 and 1743 he was assistant to Francesco Feo at the Conservatorio dei Poveri di Gesù Cristo, in that city. He also taught at the Conservatorio di Sant'Onofrio in Capuana and the Conservatorio della Pietà dei Turchini. Amongst his pupils was the Italian composer Giovanni Paisiello (1740-1816). Girolamo Abos died in Naples in 1760. He was noted for his operatic compositions which were played with varying success across Europe, including London (1756). Abos also held the posts of musical director at a number of churches in Naples, and contributed a fair amount of ecclesiastical music. Grove notes that in his church music Abos ‘followed the example of Durante, striving for a synthesis of the modern style and the traditions of sacred vocal polyphony’. Major works in this genre include his Stabat Mater, a Dixit Dominus and a Salve Regina. The liner-notes point out that the present ‘Benedictus Dominus Deus Israel’ is one of the few settings of this canticle by Maltese composers, albeit composed in Naples. This eight-movement work is scored for five-part choir (SSATB - soprano, soprano, alto, tenor, and bass) and instrumental group. Although the canticle is used throughout the year at Matins or the Daily Office, this present version exudes the joy and spirit of Christmas. Biblically, the Benedictus is the song of thanksgiving spoken by Zechariah at the circumcision of his son, John the Baptist, who was to be the prophet announcing the Advent of Christ. It is probable that this work, like the following Magnificat was composed during the final decade of Abos’ life. The delicious Magnificat is well-constructed, making use of cyclic elements as well as dramatic use of word painting. The overall impression of this setting of the Virgin Mary’s hymn of praise is one of joy, love and praise. It would serve equally well as part of the liturgy or as a concert work. I was captivated by the striking ‘Messa a due cori’ which is scored for double choir of five voices (SSATB), soloists and instrumental ensemble. It is unusual, I guess in having only a Kyrie and Gloria. I wonder if the rest of the mass is missing, or has yet to be edited. The general progress of the music is of alternating choral and solo numbers. I am not sure if this Mass was specifically composed for the Christmas season, yet once again there is a definite ‘festive’ air to this music that would make it an ideal, if somewhat long, accompaniment to the liturgy. As usual with CPO recordings the liner notes are detailed and informative. They are presented in German and English along with a translation of the original Latin texts. Details of the ensemble and performers are also included. My only complaint is that the font size is tiny, which makes for difficult reading. Unlike, Chandos, Hyperion and Naxos, CPO do not seem to make their inserts available on line. The music has been realised by Michael Alexander Willens and Dr Frederick Aquilina who edited all three works at the Cathedral Archives in Mdina. The present CD was recorded at a live event given in St Paul’s Pro-Cathedral on 21 January 2015 as a part of the Valletta Baroque Festival. The concert celebrated the tri-centenary of the composer’s birth. The soloists, choir and instrumental accompaniment give a superb account of all three works. This is definitely a discovery for me - and, possibly for many - that makes an ideal and thoroughly enjoyable Christmas treat.